To reduce Micro$oft dominance of the PC market. Links to other anti Microsoft Sites. Windoze 95 - lets see who we can con into getting this. Internet Explorer - if we give it away now, we'll make a fortune when we drive Netscape out of business and we can sell M$IE for as much as we want. Campaign for ISP's and computer retailers. Leave your antiMicrosoft messages on our guestbook. Vote - Netscape v Internet Explorer You know what I think, but what do you think? The antiMicrosoft Logo Program - Register for more information on the antiMicrosoft Logo Project. ....and other stuff is coming soon. 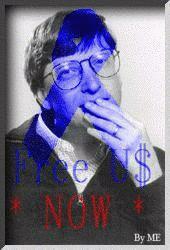 Use this utility to directly and conveniently email complaints about Microsoft to Bill Gates. This really does work. Thanks to another anti Microsoft website for this. Click Here to go to it. Choose an appropriate complaint, or enter your own. Complaint: Improve software quality! Don't force us to buy bug-infested products! Stop being so monopolising. Stop covering up lies and be more honest. Your products are atrocious! Don't do unlawful things - that's called Crime. Don't you make OS/2 versions? Don't you make Linux versions? Don't you make Macintosh versions? Don't you make Amiga versions? Don't you make BeOS versions? Don't you make Atari versions? Don't you make Acorn versions? Don't you make UNIX versions? Don't you make VMS versions? Don't you make OS/400 versions? Don't you make PowerPC versions? Don't you make Hanimex versions? http://www.geocities.com/TelevisionCity/1158/antims.html. Not a particularly interesting article but outlines my views.